Over the sunny bank holiday weekend, I called in to my local garden centre to buy a few plants for some patio pots. This is standard practice for me at this time of the year and normally I select a few varieties based on colours and combinations that appeal. 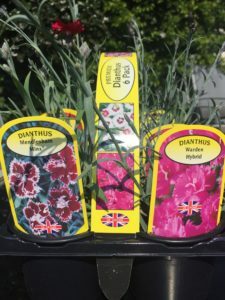 This I did until I saw the “UK grown” logo on the tray of Dianthus and remembered that I’m trying to buy UK grown plants where possible, as recommended by the RHS. This is not a Brexit issue (I voted Remain), but to aid plant biosecurity and to address the real threat of Xylella fastidiosa and other serious plant diseases entering the UK (https://www.gov.uk/guidance/protecting-plant-health-topical-issues#xylella-fastidiosa-eu-controls). This is not a straightforward issue as boycotting imported plants would impact trade, but the customer can have an effect by exercising their consumer choice. So I returned my other choices of plants based on colour to their shelves and bought the UK grown Dianthus instead.